BIOFILMS are a problem in medicine. When bacteria gang up to form the continuous sheets that bear this name they are far harder to kill with antibiotics than when they just float around as individual cells. Biofilms on devices such as implants are thus difficult to shift, and those growing on the surfaces of human organs are frequently lethal. But Matthew Chang, a biochemical engineer at Nanyang Technological University in Singapore, has worked out a new way to attack them. His weapon is a different type of bacterium, which he has genetically engineered into a finely honed anti-biofilm missile. 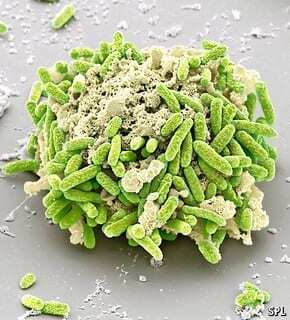 The starting point for this new piece of biotechnology is a common gut bacterium called Escherichia coli. Though this species is best known to the wider world for causing food poisoning, most strains of it are benign, and it is one of the workhorses of genetics. The story began in 2011 when Dr Chang worked out how to program E. coli to release destructive antimicrobial peptides when they came into contact with another bacterium,Pseudomonas aeruginosa. April 9, 2019 - PAAG Experimental Molecule Can Disrupt CF-related B. cepacia Biofilms Cystic Fibrosis News TodayPAAG molecule, an experimental treatment strategy against bacteria, can disrupt Burkholderia cepacia biofilms from patients with CF. March 22, 2019 - New Strategy May Boost Antibiotics' Efficacy in CF Patients, Study Finds Cystic Fibrosis News TodayRemoving a metabolite called pyruvate from biofilms of two common bacteria found in CF patients could help boost the efficacy of antibiotics, a study says. April 16, 2019 - Next Science gears up for ASX debut with product arsenal against antibiotic resistant bacteria Small CapsOne of this year's most notable IPOs has been Next Science (ASX: NXS), with the company's significantly oversubscribed offer closing in just three days. April 17, 2019 - Kane Biotech Announces Granting of Options NasdaqWINNIPEG, Manitoba, April 17, 2019-- Kane Biotech Inc.,, a biotechnology company engaged in the research, development and commercialization of. Could essential oils help prevent millions of infections every year?